A fairly new and modern memorial museum about the legendary Nuremberg Trials, housed in the very courthouse that the trials took place in, now commodified in a state-of-the-art exhibition that may be a bit short on authentic artefacts but is rich in well-presented information. You can also peek into the original courtroom 600, unless some court hearing is going on (it still serves that function some of the time). More background info: The Nuremberg Trials were the mother of all war crime tribunals, the most significant case in the history of modern international law. The Allies of WWII had long planned to put on trial those Nazi leaders that had not only plunged them into the deadliest war in history but had also committed war crimes on an unprecedented scale. The four counts agreed on were: conspiracy, crimes against peace, war crimes, and crimes against humanity (and it was under the latter that the Holocaust was covered). It was the first time that those responsible for such crimes at the highest level were to be held accountable for their wrongdoing. And the Nuremberg Trials were to become the blueprint of all war crimes tribunals and indictments for crimes against humanity ever since. Adolf Hitler himself committed suicide in his "Führerbunker" in Berlin on 30 April 1945, propaganda mastermind Josef Goebbels followed him immediately on the same site. And Heinrich Himmler, head of the SS and orchestrator of the concentration camps and the Holocaust ended his unsuccessful attempt of weaselling out and took poison too. (And Heydrich had long been dead anyway – assassinated in Prague in 1942 – cf. Lidice). So with the worst icons of Nazi evil unavailable, the Allies had to make do with the remaining squad of Nazi big shots. Amongst the very biggest names left in the trial there was first and foremost: Herman Göring, once designated as Hitler's successor (though in the end Karl Dönitz got the position for the last few days of the Reich). Göring was not only one of the key planners of WWII (in particular the Luftwaffe, including the Battle of Britain air raids) but also one of the principal icons of the Nazi leadership ranks. He was found guilty on all counts and sentenced to death. But he too eventually pre-empted his execution by suicide, taking cyanide in his cell (how he got hold of it remained an unsolved mystery and the subject of various conspiracy theories). Rudolf Hess, ur-Nazi of the earliest days, involved in the 1923 Munich putsch and the penning of "Mein Kampf", he was officially Hitler's private secretary and "Deputy Führer" – until his surprise flight to Scotland in 1941 to test the waters regarding possible peace negotiations with Great Britain. He remained interned in the UK until the Nuremberg Trials, where he was sentenced to life imprisonment. Ernst Kaltenbrunner, a key architect of the annexation of Austria in 1938 and later successor of Reinhard Heydrich as head of the Reich Security Main Office (Reichsicherheitshauptamt) of the SS was in that capacity responsible for the continued implementation of the "final solution". His own final moment came through hanging, as he too was one of those sentenced to death in the trials. Joachim von Ribbentrop was the Nazi regime's foreign minister and is probably best known for his part in the Molotov-Ribbentrop-Pact, but also put a lot of pressure on other countries to coerce them into participation in the Holocaust. He too was sentenced to death and executed by hanging. Albert Speer, Hitler's preferred architect and as thus responsible for some of the megalomaniac structures in Nuremberg itself and the proposed new capital Germania (see under Berlin), also served as minister of armaments and was therefore an architect of Nazi Germany's war effort. Speer was one of the most ambiguous cases in the trials, he appeared to co-operate with the court and showed some remorse and "gentlemanly" acceptance of responsibility, while still pleading "not guilty" in the end. He was sentenced to "only" 20 years imprisonment, completed his term in 1966, and following his release from Spandau prison went on to publish a number of autobiographical books about his Nazi time. He died of natural causes in 1981. There were many more Nazi biggies in the dock in Nuremberg, whose names may not be as universally familiar, but who still played significant roles. However, going through the entire list and their details would take up too much time and space here. You can learn about all their stories and crimes in the exhibition yourselves. This can only be a selective account. The verdicts of the Nuremberg Trials ranged from death sentences (in about half the cases) to acquittals (only in three cases) and prison terms of varying length (between 10 years and life). Some of the prison terms were later shortened significantly. Only Rudolf Hess remained in Spandau prison in Berlin to indeed live out his life in prison – in his last few years he was the sole prisoner in this specially designated building. As it turned out he didn't die of natural causes either but committed suicide too in the end, very late, in 1988 (and after that his prison was demolished). The location for the trials was decided on simply because the site hadn't been bombed out as much of the rest of the city of Nuremberg and elsewhere during the latter half of WWII. Also there was a convenient prison right next door in which to house the defendants during the trials. For decades the site was almost completely neglected from a tourist point of view. Only the courtroom 600 as such was occasionally available for viewing (normally only at weekends) as it was – and still is – in use as a place where judicial proceedings are conducted. There was nothing to interpret and commodify this highly significant place for tourist interests. Since November 2010 this has finally changed. With the new memorial exhibition, a worthy incorporation of the site into Nuremberg's unique array of historic places has been achieved and a gaping gap closed. Better late than never. And the outcome is highly commendable. What there is to see: The star exhibit, as it were, is of course the authentic location, the actual courtroom in which the trials took place back then. It's been refurbished and generally changed in appearance, but still isn't too dissimilar from what it looked like back then (the wood panelling, for instance, is still the original). However, as it is still used as a courtroom on occasions, access to it for viewing by the public is restricted. And indeed, when I visited in September 2012, I was informed at the ticket counter that a hearing was taking place, so the door to the courtroom from the staircase of the memorial museum remained closed. However, there is also a viewing window from a corner inside the main exhibition space from where you can peek in. And by the time I got to that point, the hearing was over, and the curtains were drawn back to allow a view in. The lawyers and judges were just packing up … By the time I got back down to the door to the room, however, this had been locked again as it was getting near closing time anyway. So I only caught the glimpse from the window, and did not get the chance to actually step into the viewing gallery inside the actual courtroom. I did not get the feeling that I had lost out massively, though. The exhibition as such more than made up for the limited view of the courtroom. But let's go briefly through the various thematic sections of the exhibition – without going into too much detail. A) there wouldn't be the space for that here, and B) I wouldn't want to spoilt it for prospective visitors. So here's just a gloss with a few highlights pointed out. The exhibition picks up long before the trials, even before WWII, namely with a brief synopsis of the development of modern, increasingly industrialized warfare and at the same time the efforts being made to come to some form of general agreement about conduct in war and conflict, which resulted in the first Geneva conventions, for instance. Then we move on to the rise of the Nazis and the path into the war crimes that formed the key subject matter of the Nuremberg Trials, and to the preparation of the trials themselves. Much detail is given on the legal principles adopted for the trial, and the key players, first and foremost of course Robert H. Jackson, the chief prosecutor appointed by the USA to organize the trial. The German Nazi defendants (see above) are also introduced and portrayed in some detail, as are the individual counts of indictment they were accused of. The other nations' prosecutors and judges are portrayed too, and a section is also devoted to the defence. As the latter strategies are less well known, I found their description especially interesting. Just how do you begin to defend a Nazi war criminal? I put on my battered old legal hat from my one semester of studying law (as unsuccessful as it was brief) to try and get into the prerequisite state of mind. And thus attuned it was indeed an intriguing read. Some aspects of the defence actually raised uncomfortable questions, in particular the "Tu quoque – you too" argument pointing at actions considered war crimes by the court that the Allies had pursued as well e.g. the massive terror bombing of civilian targets/cities (cf. Dresden or Hamburg), or the systematic attacks on supply routes e.g. by submarines, or the Soviet invasion of Poland from the east under the Molotov-Ribbentrop-Pact and the Katyn massacres. The court did not, however, regard pointing at alleged Allied war crimes as grounds for impunity for the defendants' crimes. Fair enough. An easier to refute, but very frequently invoked defence, especially by the defendants themselves, was the simply putting all the blame on Hitler. This was cheap and easy, as Hitler was dead and could neither defend himself nor pose a threat to his former accomplices. So they used the annoyingly familiar argument that they had "only followed orders" – still the standard response of any war criminal ever indicted in whatever tribunal. One section that my wife and I have a particular personal connection with and thus found especially fascinating was the section on interpreters and translators (my wife still is in the profession, and I used to be in translator/interpreter training during my academic university career). The Nuremberg Trials were in fact the birth place of the simultaneous court interpreting profession. The pioneering efforts made by the court interpreters (and all the other ca. 350 language staff at the trial) cannot be overestimated. Of course, due to the novelty of it all coupled with immense psychological pressure it could not be avoided that errors occurred, and some defendants may unwittingly have benefited from that. On the other hand, the point of resorting to simultaneous interpretation was to speed up the process so as to give the defendants less time to prepare answers in cross-examination. The darkest sections of the exhibition are of course those detailing the very nastiest of the war crimes committed, and this includes statements by witnesses as well as gruesome video material showing things like those heaps of skeletal corpses at Auschwitz and such like, all taken from films that were actually shown as evidence by the prosecution in the trial. The film material would apparently have been 120 minutes long – but I did not stay to watch it all and see whether the video screens in the exhibition actually showed all that material in its entirety. A good deal of space in the exhibition is also given to the actual verdicts (see above) as well as to the role of the media and the international reactions to the Nuremberg Trials. After that the exhibition moves on beyond Nuremberg. There's a separate section about the Tokyo Trials, the equivalent attempts to prosecute war criminals of Japan in the Pacific war. An even larger separate section concentrates on the various follow-up trials of 1946 to 1949 in which yet further ranks of the Nazi elite other than the main war criminals, but nonetheless figures that were instrumental in the implementation and running of the Nazis' reign of terror: doctors, industrialists, military and police, and in particular the Einsatzgruppen. Further trials held later are also given a mention, such as the Eichmann trial in Israel in 1961 as well as the Auschwitz trials in Germany. A final section cast the net wide, on a global scale, and brings us up to the present day. One part briefly introduced the huge number of worldwide crimes against humanity in places such as: Rwanda (1994 genocide), Argentina, Congo, Uganda, Bangladesh, Cambodia, Sri Lanka, and so on and so forth. Another part of this section plots the development towards the International Criminal Court in The Hague, in the Netherlands, as well as the International Criminal Tribunal for the former Yugoslavia (also in The Hague), and the role of the tribunal in trying the perpetrators of the atrocities especially in Bosnia (in particular Srebrenica). 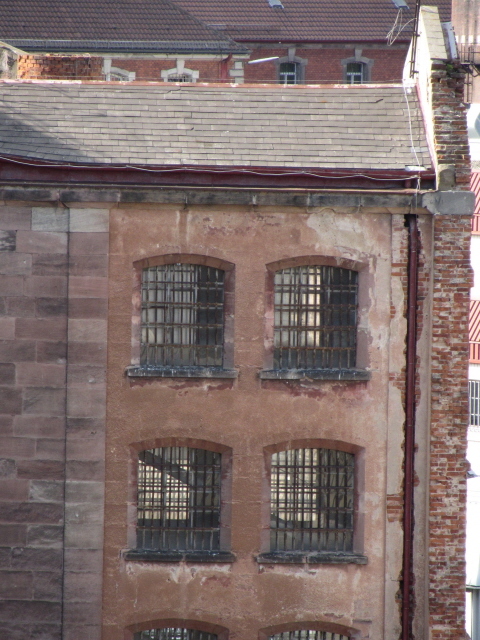 From the windows in the follow-up trials section of the exhibition rooms you can see the remainder of the old prison in which the Nuremberg Trial defendants were held back then. Much of the original prison complex has been demolished and replaced by modern cell tracts. But one of the old red-brick wings still stands. Finally, there is a cinema room – but at the time of my visit it was silent. The small book stall at the reception desk includes a volume that has the entire exhibition in English and richly illustrated too. Recommended, especially if you find the actual exhibition a bit overwhelming and want to read up on it all afterwards. All in all an excellent addition to Nuremberg's museum portfolio. Highly recommended. Location: west of Nuremberg city centre, at Bärenschanzstraße 72, just off the main western thoroughfare of Fürther Straße, ca. 1.5 miles (2.5 km) from the core of the old town. Access and costs: just a bit off the main beaten tourist track, but fairly easy to get to; moderately priced. Details: To get to the memorial site you can walk from Nuremberg's old town/city centre – it's only about a mile (1.6 km) from the south-western edge of the city walls, or about 30-40 minutes' walk from the heart of the old town. Alternatively you can get public transport: it's only a few stops on the U1 metro that goes right through the city centre (e.g. main station, Lorenzkirche or Plärrer); the stop to get out is also called Bärenschanze. To get to the memorial take the northern exit and walk along Fürther Straße in the direction away from the city centre and then turn left at the corner of the huge courthouse complex. The memorial, slightly set back from the main street, is clearly signposted from there. Driving to the site is not recommended due to limited parking space. Admission: 5 EUR (various concessions and combination ticket schemes apply), including an audio-guide. For an additional surcharge of 2.50 EUR you can obtain a day pass that also gives you entry to all other official city museums ('städtische Museen'), including the Documentation Centre Nazi Party Rally Grounds at the Congress Hall! Opening times: Wednesday to Monday 10 a.m. to 6 p.m. (last admission 5 p.m.); closed on Tuesdays. NOTE: the actual historic courtroom 600 is not always open for the public to view, as it still serves as a criminal court hearing room and during trials the public will be excluded. At what times that will be varies unpredictably, and to make sure you pick a time when it is available for viewing you'd have to check ahead at short notice (tel. : +49((0)911)-321-79372). Time required: between one and two hours; longer if you want to watch all the films/audio-visual material. If you want to spend a long time here it will be welcome news that there are little stools available on which to have a sit-down while reading or listening to all the material. Combinations with other dark destinations: in general see under Nuremberg – the most obvious combination is that with the Documentation Centre Nazi Party Rally Grounds at the Congress Hall in the south of Nuremberg. Reduced-price combination tickets for both of these (and more) are available – see above under access and costs. Combinations with non-dark destinations: the location may be off the main tourist trail, but it isn't too far to the centre of Nuremberg to get all the half-timbered houses, castles and other expected "romantic" clichés of southern Germany.